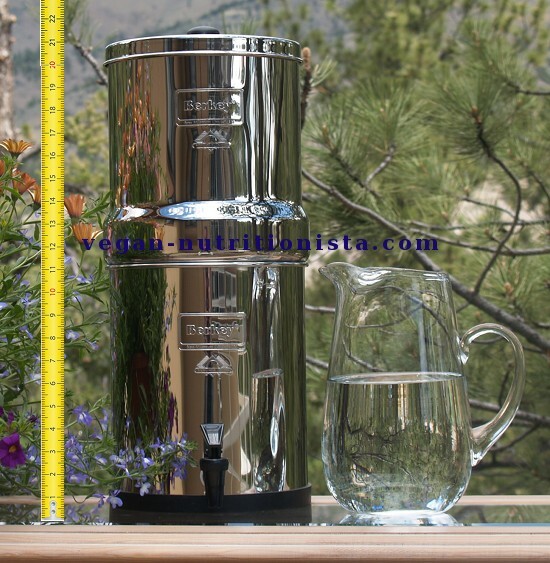 I wanted a Berkey water purifier for years before we bought one and it's one of the top five best investments we've ever made in our health. Seriously, it's that good! 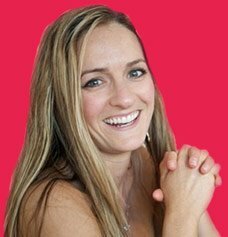 When I started living a more healthful life, something I noticed right away is that one decision led naturally to the next. I’d make a change and realize that not going all the way was pointless. 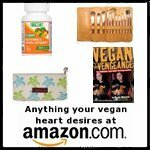 I was a vegetarian for 12 years until I realized that for all the reasons I believed in not eating animals I should also not be eating any animal products. I decided to change all my toiletries to be vegan but realized there was zero point in not choosing the most organic, whole, natural products to put directly onto my skin and hair. Water became one of those natural progressions towards a healthier body. For years before I had a Berkey I understood that there was little point in making all these changes while I was still feeding my body and skin with water from my tap. We used a little pitcher filter, but I could tell that it was doing very little. It was like putting a brillo pad on top of my water glass and crossing my fingers that it would remove some amount of impurities. Everyone knows that city water is treated with chemicals that remove parasites, but did you know that many survive and make it into our faucets? And then what we don't often think about is how we are then drinking those same purifying chemicals. Tap water is contaminated with heavy metals like mercury, lead, and arsenic. Pesticides and herbicides run off from farms upstream of the water supply. People throw medicines like antibiotics, hormones, and the prescription (and non-prescription!) drugs down the drain. Two more controversial added treatments are chlorine and fluoride, which are chemicals we don’t need that can destroy our health. We assume that our cities are providing us with clean, safe drinking water, but studies show that this is often not the case. If you’re interested in checking out your everyday water supply, you can contact your water provider to find out the most recent test results. The reason I chose Berkey is because they are the best. It filters out more pollutants than any other filter on the market that I’ve found. It’s simple. You just pour water in the top container and it goes through the filters and comes out the bottom clean. What about reverse osmosis water? A lot of health conscious people opt for reverse osmosis water purification systems because they filter out impurities, but the problem is that they also purify out all the beneficial minerals from the water. Two of the most important minerals that reverse osmosis removes are calcium and magnesium, essential nutrients that vegans are often hounded over to consume. Water purified through reverse osmosis has 92-99% less calcium and magnesium than regular water. When you drink water with so few minerals, your body leeches calcium and magnesium, so that just a few months of drinking RO water can create a severe deficiency. Um, no thanks! Stripping the minerals makes the water acidic rather than neutral. There’s also evidence that it doesn’t even hydrate your body well either, so what’s the point? You can remineralize reverse osmosis water by adding the lost minerals back into the water, but it’s important to do so in the proper quantity. There are filters you can buy that remineralize your water, but to me it seems a lot like enriched flour. It’s stripped of its natural healthfulness and then has them added back in after processing. It’s not for me. You can’t remove fluoride, VOCs, or endocrine disruptors in RO filters either. Add to the health side effects the fact that RO filters use several gallons of water for every gallon of water produced, so it’s wasting water. I live in California and that’s a cardinal sin around here. Many of us live in areas of the world that are prone to natural disasters, especially as the effects of climate change become more dramatic. If your water supply goes out or is damaged in some way, you will need to have a gallon of water per day for every person in your family, as well as water for pets. When I was creating my emergency kit, I realized that I wouldn’t be able to estimate how many days we’d be out of water and that carrying a huge amount of water bottles would be heavy and take up a huge amount of space. Plus, you've probably heard that there are greater restrictions on tap water than bottled water. They often have different types of chemical salts, E. coli, and the bottles can emit toxins into the water over time or if the bottle is heated. 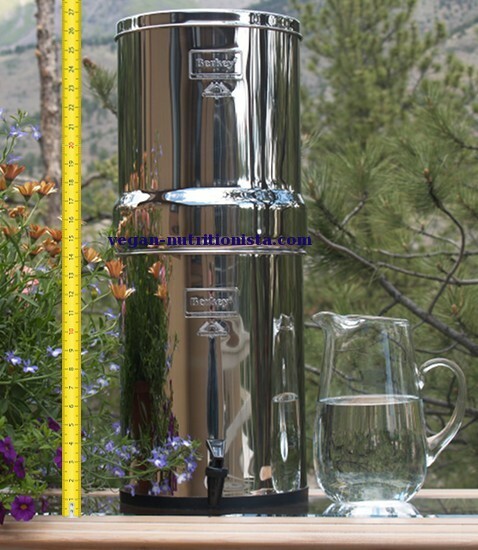 The Berkey water system is called a gravity water purifier because it doesn’t use any type of electricity; the water simply filters down into the second container below the filters. Not needing electricity is crucial during an emergency. I’ve only found two downsides to Berkeys in the past 4 years I’ve had one. One, you have to feed water into the top filter and it takes time to filter through so if you forget to fill it, you’ll have to wait to have drinkable water. Two, they sit on the counter and take up space that for many people in big cities is a premium. The upside is too high for me to even place importance on these downsides. Right now our Berkey is on top of our dryer in the laundry room adjacent to the kitchen. Doesn’t bother me in the least. Maybe one day I’ll have an enormous kitchen counter where it isn’t in the way, but even if I moved into a tiny house I’d find a place for my water filter. 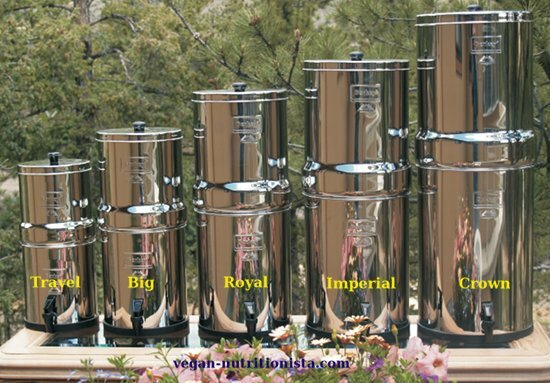 Which Berkey is the Right Size for you? This is the smallest Berkey water system that is absolutely perfect for a small emergency kit in the car. It's popular for camping, sporting events, and hiking. It holds a quart of water and can filter 50 gallons a day if you fill it continuously. You can actually pack the Travel Berkey in your suitcase, which means it's also great for tailgating, camping, hiking, or other outdoor events. The Travel size holds 1.5 gallons of water a day, with potential to filter 60 gallons a day if you were continuously feeding it water. It would be plenty of water for between 1-3 people. The Travel Berkey with one Black Berkey filter is $249. 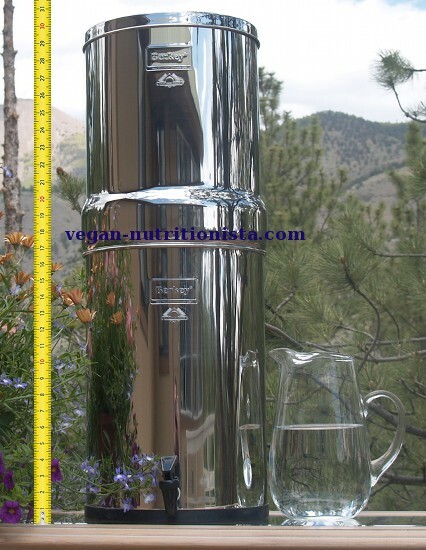 The Big Berkey water system holds 2.5 gallons and is a popular size for small families, 3-4 people. It can filter through 168 gallons of water a day. 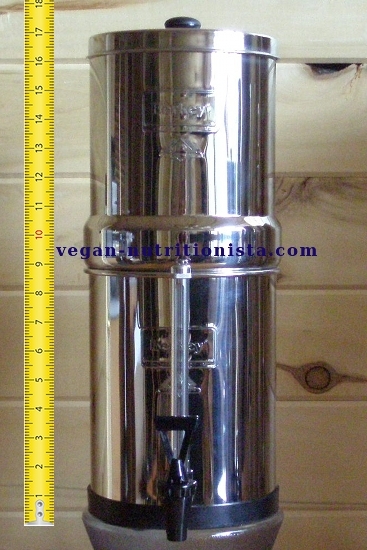 This is the most popular size Berkey. The Big Berkey with 2 Black Berkey filters is $279. The Royal holds 3.25 gallons of water and if you are continuously feeding it, you can filter 190 gallons a day. This is a great size for a medium size family, around 6 people. We use a Royal at home for our family of 3. We drink almost exclusively from home and also use it to cook for three meals a day. 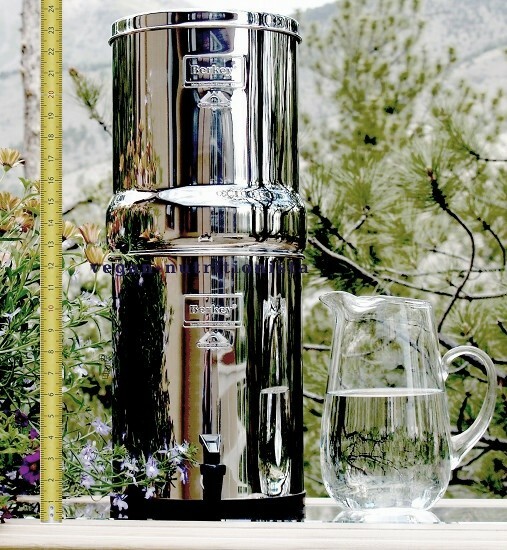 The Royal Berkey with 2 Black Berkey water filters is $308. The Imperial is much larger, holding around 4.5 gallons of water and filtering through 325 gallons a day. This is a good size for small groups, around 12 or more people. It would be a perfect fit for a retreat, a family reunion, or teammates on a soccer team. The Imperial Berkey with two black filters is $338. The Crown is the largest size Berkey water purifier, with the potential to filter 624 gallons a day, and holds 6 gallons. This can accommodate large groups of people and would work perfectly for long term survival of bigger groups. Many people opt to get this bigger size just for their personal use as well so they don't have to refill the top compartment as often. The Crown Berkey with 2 Black Berkey water filters is $357. We've had our Berkley for about four years and I've changed the filters once. They can last for years, but a good way to estimate how long yours will last is to factor about 3000 gallons can be filtered with one Black Berkey filtering element. Most of the sets have two black filters, so 6000. Two members of our three person family stay home and drink about a gallon a day of water, and we also use purified water to cook three meals a day. We can get about 2-3 years out of our filters. 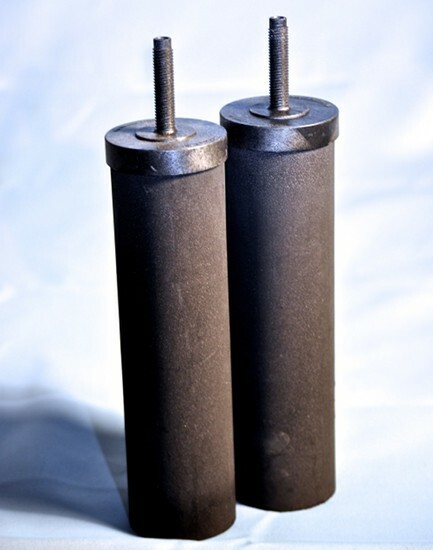 You can buy black filters to replace your existing ones, and you can also pick up more for the larger sized Berkeys, which will extend the number of years you will be able to use them. A set of two black Berkey water filters is $114. You can add a filter to the bottom of your unit that filters out fluoride and arsenic. Municipal water in most areas is treated with fluoride in what I'll call a "misguided" attempt to help us maintain strong teeth. At the very least, it's mass medication that most people are completely unaware of and over which none of us have any choice. The American Dental Association still stands behind fluoride, so it's a highly controversial topic. The Environmental Protection Agency commissioned a big study published in 2006 on the safety of fluoride. The end result was them lowering the recommended level in our water, but still deeming it safe. There aren't randomized studies on fluoride ingestion however. Also, the actual parts per million in the water supply can vary greatly, so it's difficult to keep it at a "safe level." Fluoridation is not done in most developed countries and in recent years many European countries have banned the practice. Regardless of where you stand on the controversy over whether it is a good idea to put this medicine in our water supply, we do not need fluoride to maintain dental health. I highly recommend adding this filter to your system. Also, keep in mind that you need to replace the fluoride filters on your systems once a year. 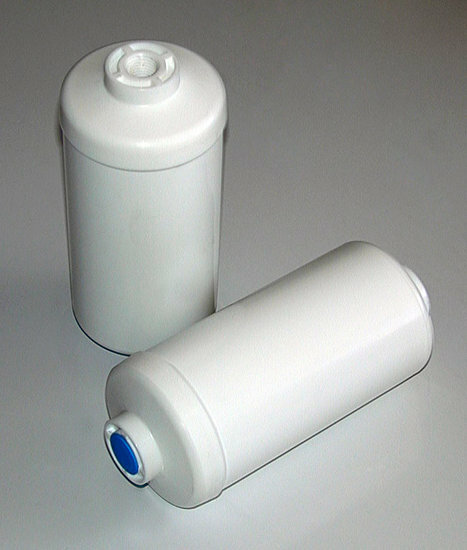 A set of two PF2 fluoride and arsenic filters is $61. One of my favorite accessories is the metal stand for holding your Berkey water purifier. It looks nice, raises the Berkey off your counter so you don't have any standing water issues, and it leaves space for a glass of water below the spigot so you don't have to balance the filter on the edge of your counter. 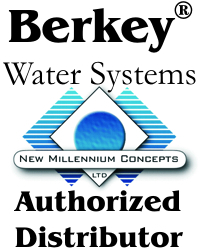 I am an authorized dealer for Berkey Water Systems, so if there's something you need from them that you don't see listed on this page, send me an email and I can get you information on that product. I understand that you will use my information only to send me information about Berkey water filters.